The current trend in organizations is to distribute real time financial and performance information to managers in order to improve the quality of information available to them and to enable them to respond nimbly to events facing the organization. This is often accomplished through a dashboard – a visual tool that represents key activities and data in graphical form to provide a quick snapshot of the overall state of the business. Like with the dashboard of a car, you can see at a glance the critical information you need to monitor to make sure everything is running smoothly. More and more non-profits are embracing the tool for internal planning and management and, in some cases, using it as a tool to communicate with external audiences. The Indianapolis Museum of Art has incorporated a dashboard into the home page of the website, demonstrating the wide appeal and efficacy of the instrument. The primary reason for undertaking and adopting a dashboard is to aid in accountability and to help the organization stay focused on what is important. 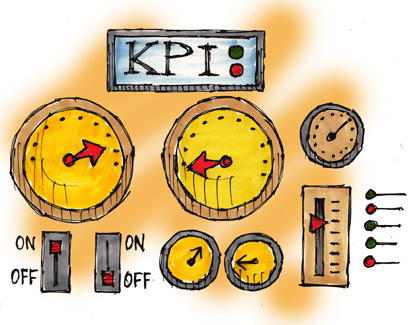 Dashboards provide a simplified, holistic view of the organization’s performance. Not all staff members are comfortable or fluent in financial and business metrics. A dashboard provides an overview that is easily grasped which enables informed discussions. It also provides staff members and the board with a common language to discuss organizational performance and support better decision-making. Most importantly, a dashboard makes visible and obvious things that may be important to an organization but otherwise could go undetected. Dashboards, like most business tools, can be simple or complex depending on the number of data sources, the level of detail needed, the resources to maintain it, and budget. Nearly all business software programs, such as Salesforce and Google Analytics, have their own built-in dashboards that serve as the primary interface. Directors, however, need a single dashboard that pulls data from several, interrelated sources to provide a snapshot of the whole picture. They measure the Key Performance Indicators (KPIs) which often include cash receipts, expenses, volunteer hours, numbers of new donors, etc. Many businesses simply use an excel sheet to track and analyze the information and then render and present the findings in a PowerPoint presentation. While inexpensive and widely available, this approach is time-consuming since it requires manual effort to collect, input, analyze and format the information. For most non-profits, if kept simple and consistent, a spreadsheet is a good place to start in order to understand where and how to use a dashboard before investing in more sophisticated options. The Non-Profit Technology Network (NTEN) has an informative article on their blog including a sample excel sheet that you can download and customize for your specific needs. There are several software companies, such as iDashboard and Qlikview, that provide solutions specifically designed to compile data from various sources and serve up the information in an easy-to-understand dashboard. With the rise in cloud computing, many companies offer both enterprise and hosted solutions, providing affordable options for smaller companies. Qlikview even has a program where they provide their solution free to humanitarian and community-focused non-profit organization as part of their community-service. In future blogs, I’ll address how you build a dashboard including determining who the users are and should be, how to determine what critical information to capture and measure, and how best to report it along with the decision-making triggers. And in a separate article, I’ll cover how to implement one and get your team involved and engaged.